From Point Blanc to Skeleton Key to Eagle Strike to Scorpia to Stormbreaker, the Alex Rider adventures have finally come to it's end. With Ark Angel, Alex becomes friends with Russian multi-millionaire Nikoli Dreven. Nikoli is the first man to make a hotel on the moon. 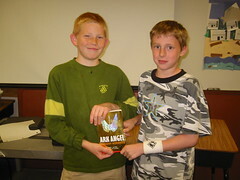 If you have read Alex Rider, you know lts name, Ark Angel!! !